Highway and street speed limits, licensing of drivers, and all other rules governing automobile use are set by each state's legislature. 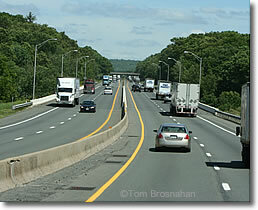 In general, you must be 16-1/2 to 18 years old to get a driver's license in the six New England states. Age varies by state. Maximum speed on some highways in New England is 55 mph (89 kmph), though many drivers regularly go 60 mph (97 kmph) or even 65 mph (105 kmph). Some expressways have speed limits of 65 mph (105 kmph). Traffic often flows at speeds 5 to 10 mph above the speed limit. Sometimes the police stop and fine drivers going faster than the speed limit, sometimes they don't. Fines for speeding can be as high as $20 for every mile-per-hour you exceed the speed limit, so the fine for driving 75 mph in a 65-mph zone could be $200. After several offenses, your driver's license is revoked for a period of time. Police use radar to detect speeding drivers, but some drivers use radar detectors to warn them about police speed traps. In Connecticut, it is illegal to mount or to use a radar detector. If you are caught speeding in Connecticut, and if you have a radar detector in your car (whether or not it is connected or in use), fines may total more than $300. If you must go very fast, take an airplane; it will cost less than getting caught speeding! Laws requiring use of car safety belts are common, and every intelligent driver knows that the chances of surviving an accident and avoiding injury are increased greatly if safety belts are worn. Throughout the United States, infants and small children (under four years of age) are required by law to be placed in child safety seats secured by seatbelts. Child safety seats are available from car rental firms at extra charge.